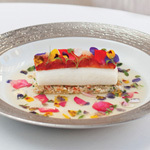 All those who prepare and enjoy Gigha Halibut are celebrities in our eyes. We hope that all contributions to this recipes page will inspire all who visit. We are very lucky to be supported by the finest chefs who have kindly agreed to share some of their Gigha Halibut recipes with us. 1) For the sauce, place vinegar, olive oil, rapeseed oil, Dijon mustard and caster sugar into a jar and shake until emulsified. Pour into a bowl, add in chopped herbs, shallots, corichons, capers and eggs. Stir and season. 2) Pour 6cm of oil into a medium-sized heavy-bottomed saucepan, or use a deep fat fryer. Heat to 160°C. If using a saucepan, please be careful as the oil will be very hot. Dip the oysters into the flour, then egg, then breadcrumbs. Fry until golden brown. Remove with tongs and place onto kitchen paper to soak up excess oil. Season. 3) Slice the halibut. To serve, place a spoonful of the ravigote sauce into each oyster shell. Top with the fried oysters and slices of halibut. Serve with quarter of a lemon. 1) Lightly butter 1 sheet of phyllo dough. Lay another sheet directly on top of the first sheet, and lightly butter it. Repeat with remaining 2 sheets of phyllo. Cut sheets in half. 2) Season halibut fillets with salt and pepper. Place a fillet near the bottom edge of one of the halved sheets of phyllo. Sprinkle with dill. Fold in the sides of the phyllo, then roll the fillet. Place on a baking sheet, and lightly brush with butter. Repeat with remaining fillet. 3) Bake in a preheated oven until pastry is puffed and golden brown, about 12 to 15 minutes. 4) Meanwhile, bring lemon juice to a boil in a small saucepan over high heat. Boil until almost evaporated. Reduce heat to medium, and stir in cream. Simmer until the cream thickens somewhat. Stir in green onions, and season with salt and pepper. Serve halibut on a pool of sauce. 1) Make beurre blanc: In a small saucepan over medium heat, combine wine, vinegar, shallots, thyme and bay leaf. Boil until liquid has evaporated. Stir in cream, and boil until liquid is reduced by half; decrease heat to low. Whisk in butter, 1 piece at a time, adding each new piece before previous one has melted completely. Do not allow sauce to simmer, or it may separate. 2) Strain sauce through a fine sieve into a heatproof bowl. Stir in chives, lemon juice, salt and pepper. Keep warm by setting bowl in a larger container of hot water. 3) Preheat oven on broiler setting. Pat fillets dry, and season with salt and pepper. 4) Heat oil and 1 tablespoon butter in a large skillet over medium-high heat. Saute halibut fillets for 2 to 3 minutes on each side, or until lightly browned, and just cooked through. Transfer to a baking sheet, and cool 5 minutes. In a small bowl, stir together bread crumbs, almonds and 1 tablespoon melted butter. Brush tops of fillets with egg, and spread with almond mixture. 5) Broil fillets 1 to 2 minutes, or until browned (watch closely – every broiler has its own personality!). Place fillets on individual plates, and spoon beurre blanc around it.